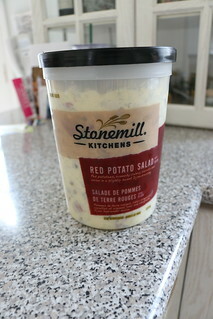 So, as you might have already guessed, this is about potato salad. For me, the key to making a creamy salad is the dressing. I mean, that’s probably what it’s about? No? Yes? From what I recall, somebody brought this over to a family barbeque. I don’t know what got over me, but I asked my aunt (who has a Costco membership) to be the look out…to get the salad whenever she can. Then after a month, she finally got it. Then I realized..it’s too big. I mean, my mom and I can’t possibly finish it before the expiry date..can we? Costco will always be Costco, almost everything is family sized pack.